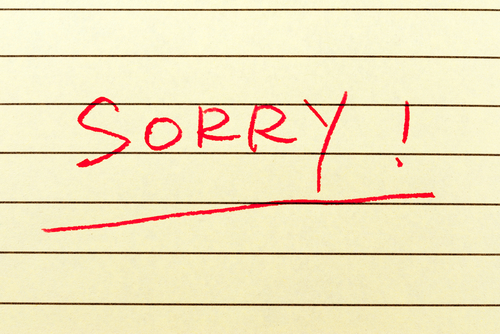 5 times customers should say "sorry"
When you’ve taken something you shouldn’t. When you’ve damaged a company’s reputation. It’s easier than ever to irreparably damage a company’s good name online. Just a few weeks ago, a disgruntled airline passenger paid Twitter to promote a damaging message about the company after it lost his father’s luggage. But what happens when it isn’t the company’s fault, and it stands accused of doing something it hasn’t? (The airline found the missing luggage and returned it, along with an apology.) What if someone else were to blame? Isn’t the business entitled to an apology? Absolutely. When you’ve damaged store merchandise. You know the old saying, “If you break it, you pay for it.” Well, it should be common sense, but I’ve seen customers walk away from a display after knocking merchandise to the ground, offering a “not-my-problem” shrug. Seriously, this isn’t something an advice columnist should have to tell you, but keep reading and I’ll share why this is so important. It’s amazing how many people feel as if they are entitled to more than a simple apology when an employee has been a little short with them. But they don’t give a second thought to berating an employee (after all, isn’t the customer “always right”?). One of the keys to getting better service is realizing that the employees are people, too, and want to be treated like people, not customer service ‘bots. So when you cut loose on someone, take a deep breath and apologize. There’s no reason to leave your manners at home — ever. When you’ve asked for too much. This happens more often than you’d think. Consumers often harbor unrealistically high expectations, and when they’re not met, they drag law enforcement, regulators, management — and eventually, me — into the argument, demanding more and more before they’re happy. If at any point along the way they take the time to listen to anyone who tells them the product is out of warranty or that they’re expecting something it never promised, then these impossible-to-please customers ought to say they’re sorry. After all, they just wasted the company’s valuable time. And here’s why this matters: When enough customers steal or break merchandise, badmouth the company and make ridiculous demands, and they don’t make amends, then it poisons the already strained relationship between customers and companies. Businesses aren’t dumb. They’ll tighten their return policies, ask their lawyers to draw up even more onerous terms and conditions for their customers, and they’ll authorize their employees to hang up on you when you’re upset and you call to complain, in order to protect them from possible abuse. Isn’t an apology the easier way to go? Have you ever apologized to a business?